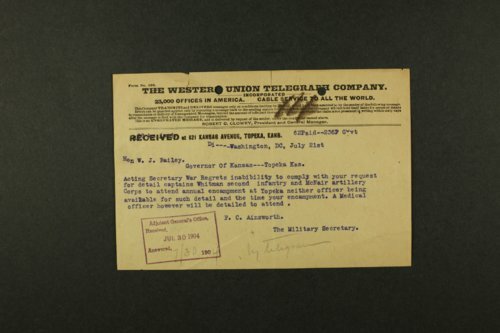 Correspondence sent and received by the Kansas Adjutant General's Office and the U.S. War Department between July 1904 - December 1906. Letters were also sent to Governor Willis J. Bailey and Governor Edward W. Hoch. Kansas Adjutant Generals during this period were Samuel H. Kelsey and James W.F. Hughes. Correspondents include Brigadier General William Crozier at the Office of the Chief of Ordnance, Quartermaster General Charles F. Humphrey, and James W. Cheney, librarian of the War Department. Frequent record-keeping information is solicited on behalf of the Secretary of War, the Office of the Commissary General, and the Surgeon General's Office. Topics discussed include general orders, army appropriation bills, payment of expenses, and annual reports.